Highly ornamental large red flowering shrub 6-8'. 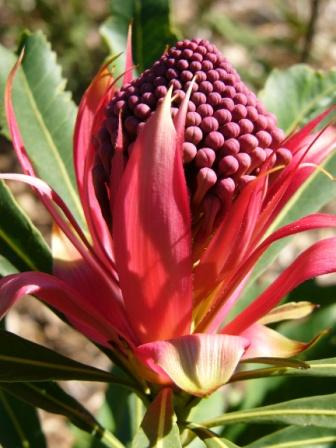 Floral emblem of New South Wales. Prefers well-drained acid-neutral soils. Full sun on coast, part shade inland. Very frost tolerant. Prefers container growing in southern California as I don't think it likes the alkaline soils and water. Grows beautifully in northern California. Excellent cut flower. Prune heavily after flowering for flower production the following year. Excellent container plant. Attractive seed pods. Propagation Information: Fresh seed germinates readily.